He grew up watching it with his dad and older brother Geoff. He grew up playing it, pitching and sometimes manning first. It was his first, his only, sports love. When Mitchell entered the ninth grade, he was 6-foot-5, 240 pounds and still growing. Geoff, a junior, was a 6-foot-6 monster at offensive tackle who was being courted by Division I football programs. The JV football coaches at Palisade Charter High saw Mitchell at orientation and salivated. "They said, 'You're going to be better than your brother,'" Schwartz says. But Schwartz hadn't played a snap of competitive football in his life - and he didn't want to. That, as it turns out, wasn't the opinion that mattered the most in the Schwartz family. Geoff, who saw more in his brother than a second-rate prep pitcher, had the final say. "My brother forced me into it," Mitchell says. Schwartz begrudgingly joined the team on the condition that he would have the opportunity to try out at quarterback. "I could throw the ball, but that got shot down very quickly," he says. "Within a week, they were like, 'You know, we need a little bit more of a mobile guy for this offense. We're going to have to move you to offensive line.'" It was a clever move, roping him into the team with the bait of quarterback and then switching him to his true position after he'd made the commitment. Some people would have quit over it. Schwartz probably appreciated the trick. Cal's junior left tackle is a very quiet man. He isn't the type of quiet that suggests vacuity, though. His intelligence is evident quickly, even when he's silent. Because while you're busy talking, he's trying to read you. "I've always been interested in mind games," Schwartz says. "Being able - not to read people's minds - but understand why they do things." Academic intelligence and athletics are often thought of as mutually exclusive. For Schwartz, it was the intellectual challenge that strengthened his initially tenuous link to football. "It helped me on the field - being a little more analytical about stuff. Reading defenses, and knowing what's coming," he says. "There's always indicators if you just calm down and pick up on it and not get too wrapped up in the moment." Picking up on those subtle indicators has become a scholarly endeavor for Schwartz. 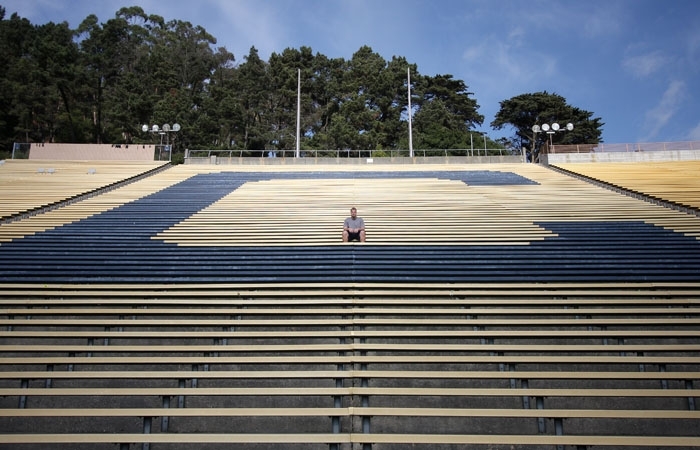 He graduated high school with a 4.3 GPA, and came to Cal intending to study psychology. He took the classes, read the books, but walked away dissatisfied. "All the classes here don't really do much for you in terms of actual application," he says. "It's just reading from a book. You definitely learn a lot more if you're conscious of it just through your own personal experiences and interactions with people." On the field, he found those experiences. While other players were still slogging through the conceptual maze of the playbook, ("The playbook has always come easy for me. I feel like the playbook is pretty simple. "), Schwartz skipped straight to the application. He could trust in himself to execute the play, so he turned his focus to the man across from him. Like Simon Baker's character on 'The Mentalist,' one of Schwartz's favorite TV shows, Schwartz looked for the tiniest of cues from the defense to anticipate their next move. His cerebral approach caught the attention of both his teammates and coaches. After redshirting his freshman year, Schwartz was immediately named a starter. "Since he understands the game and has had so many starts, he can calm himself there," tight end Spencer Ladner says. "A lot of people have nerves. He's very calm and confident out there in what he's supposed to do. What he can do." If you look back at Schwartz's high school profile on Scout.com, you'll see it lists two areas for improvement. The first is technique. The second is a nasty streak. Four years later, Schwartz still hasn't developed that. Four years later, he's started every game of his collegiate career and is considered one of the best offensive lineman in the conference. The scouts were wrong about that nasty streak. He's smart enough to not need it. Over the summer, Schwartz played a lot of "Call of Duty". "I got to the point where I was too competitive with myself," he says. "I had done pretty well for a while, and it just got to the point where if I wasn't doing it at that level, it was frustrating, and if I was, I expected it. It was a lose-lose." So Schwartz sold the game back and pocketed the $22 of store credit. It's no loss. There will be another game for Schwartz. Something new that captures his interest and holds it - at least for a little while. Right now, it's fresh and interesting. This is, after all, just his seventh year playing competitive football. There are new challenges that await him because this game, as he well knows, is still a mystery. "Sometimes you can just look at a guy and, for whatever reason, you just know," he says. "A couple times, it's been weird. I'll make eye contact with someone on defense and know they're coming." Most of the time, when Schwartz looks at the man across from him, he doesn't know. That this might be the one game he can't outsmart.